Published History Books by Heir Line's Professional Genealogists. Non-fiction history titles inspired by the fascinating stories Michael and Caroline Rochford have unearthed during their professional family tree research. 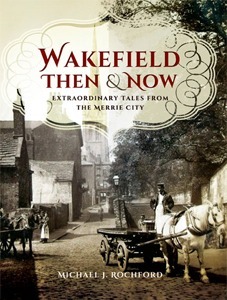 Wakefield Then & Now: Extraordinary Tales from the Merrie City. The escaping bear who’d had enough of being a Victorian showpiece; tragedy narrowly averted over the skies of Wakefield when a balloonist lost control in 1827; secret passages and hidden relics; and dark tales of determined village ghosts. These are among many enchanting stories within the pages of Wakefield Then and Now: Extraordinary Tales from the Merrie City. 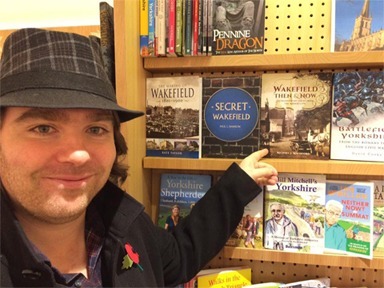 In this fascinating book about his home city, Michael J. Rochford has gathered dozens of accounts from Wakefield folklore, presented as a quirky historical tour. Images from times long forgotten in the form of early photographs, topographical drawings and romanticised paintings bring the stories to life before your eyes, as modern photographs contrast how things were with how the proud city appears today. "Escaped bears, out-of-control hot air balloons and tales of secret passages - this book has it all. Rochford's enthusiasm for his home city is evident in this book which combines folklore and lively stories with fascinating historical detail. 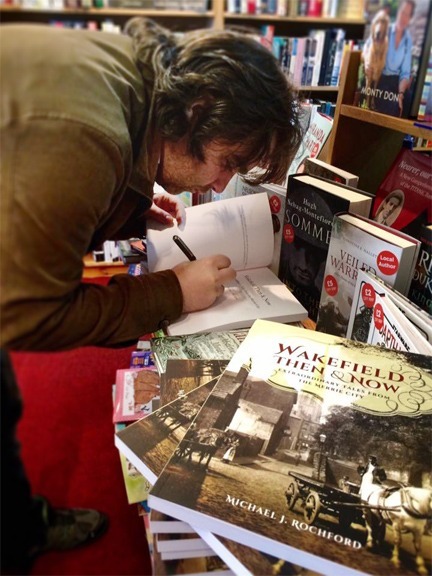 Wakefield Then & Now paints an intriguing picture of changing cityscape that you'll want to explore too." - Who Do You Think You Are? Magazine, November 2016. "Terrific local colour and interest for people from the area. Brilliant." - Books Monthly magazine, November 2016. 900 Years of its History and People. In the twelfth century, St. Oswald's Priory at Nostell, near Pontefract, was home to canons of the order of St Augustine. When it was dissolved during the reign of Henry VIII it was one of the wealthiest priories in the country. In secular times, a grand house on the site was home to the Gargrave family, whose rapid rise had seen Sir Thomas Gargrave attain the offices of Speaker in the House of Commons and High Sheriff of Yorkshire during the days of Queen Elizabeth I. But within a couple of generations the family was ruined. 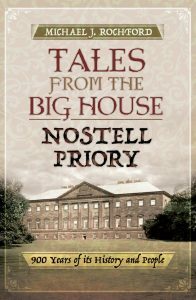 Sir Thomas's grandson and namesake, into whose hands Nostell had come, was executed in 1595 for committing murder by poisoning, a deed shrouded in mystery and misinformation for centuries until now. Then in 1654, Nostell became the property of the Winn family. Having shown him great support during the Civil Wars, Charles II made the family baronets. The following century, Sir Rowland Winn, 4th Baronet of Nostell, began work on a brand new, magnificent Palladian house, known today as Nostell Priory, in honour of the medieval canons who had once worshipped on the site. His descendants would cede the title, but in 1885, another Rowland Winn of Nostell, who was Conservative MP for North Lincolnshire, was made Baron St Oswald following his party's election success. An Eighteenth-Century Country Lady's Household Handbook. Pen and Sword, 2020 (TBC). Michael J. Rochford's third history book is currently in production. The book will feature illustrations by fellow author, Caroline Rochford. 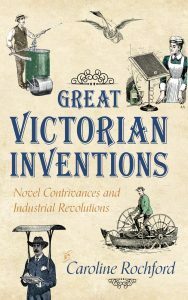 Great Victorian Inventions: Novel Contrivances and Industrial Revolutions. Who invented the flying machine? Was the Titanic really the first 'unsinkable' ship? How would one use a phonoscope? Using old Victorian documents, Caroline Rochford takes the reader on a guided tour of hundreds of fascinating 19th century inventions from across the globe, some strange and some remarkably familiar. Think solar power is a modern concept? Think again! Today everyone has a camera, but imagine the excitement of taking a snap of a giraffe hotel! This is a surprising journey, taking the reader on a trip from the clouds to the bottom of the ocean, with stops everywhere in between. 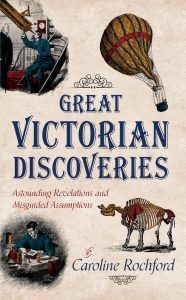 Great Victorian Discoveries: Astounding Revelations and Misguided Assumptions. In this brilliant and bizarre follow up to Great Victorian Inventions, Caroline Rochford reveals the wondrous experiments and bizarre theories of the great minds of science, engineering and natural history of the Victorian age. Some discoveries are authentic, some simply misguided assumptions giving rise to strange beliefs. This book exposes the strange belief that Martians were constructing waterways on Mars and that the sun was really blue. It enters the world of botany with the discovery of a plant that had the ability to uproot itself and 'travel' across the landscape, along with an ornamental tree that 'ate' iron nails. Within these pages you can relive the moment when a German medical student accidentally splashed a liquid chemical in to his face and found it turned his eye numb, thus discovering local anaesthetic, and learn how green Victorians tackled the threat to fossil fuels by converting straw into energy. 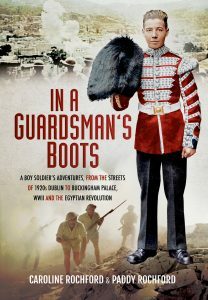 A Boy Soldier's Adventures from the Streets of 1920s Dublin to Buckingham Palace, WWII and the Egyptian Revolution. When he was just eight years old, Paddy Rochford enrolled at Dublin's Royal Hibernian Military School. He was taught how to be a soldier with the British Army, like his father. Because of the Irish civil war, Paddy and his fellow pupils were evacuated in 1922. Thus Paddy came to England. Across the sea, Paddy joined the Third Battalion of the Coldstream Guards as a drummer boy, with postings to Windsor Castle, Buckingham Palace, the Bank of England and the Tower of London, where he guarded the royal family and Britain's treasures. In the 1930s, as thousands of Jewish families fled Nazi Germany, Paddy was sent to Jerusalem, charged with keeping the peace between the local Arabs and the Jewish immigrants. During the Second World War, he was part of the Western Desert Campaign in Egypt, defending British territories. Following his wartime adventures, the young sergeant went on to train the Egyptian Army, where a bond of friendship grew between him and the future president, Colonel Nasser. Learning Nasser's plans to oust the British from Egypt, Paddy tried in vain to warn his superiors prior to the bloody revolution of 1952, which signalled the end of British supremacy in the Middle East. Paddy retired from the army soon afterwards, moving his young family to Yorkshire, where he began writing these, his enthralling memoirs about a young boy who spent a lifetime growing into his boots. A Treasury of Voices from our Maritime Past. Stirring tales of heroism at sea have been engrained in the annals of maritime history since time immemorial. Christopher Columbus' discovery of the New World, Queen Elizabeth I's defeat of the Spanish Armada, and Horatio Nelson's victory at Trafalgar are just some of Britain's most memorable naval triumphs. But what about the lesser-known tales from our seafaring past? The Victorian who invented a swimming machine in order to cross the English Channel. The capture of a 'real-life' mermaid. The lost pirate treasure of Alborán. The ghost of a murdered sailor who still haunts the streets of Portsmouth. The daring explorers who vanished into the blue yonder, leaving behind nothing but a cryptic message in a champagne bottle. These are just some of our quirky naval stories that have been chronicled in verse and archived in newspaper clippings, and then forgotten with the passage of time. Historian and genealogist, Caroline Rochford, has thus packed 150 traditional songs and stories into this book, which offers an exciting, entertaining and eye-opening glimpse into our long lost maritime past. Michael was born in the old Manygates maternity hospital in Wakefield. He went to school and college in the city, later gaining a Bachelor of Arts Degree – and then a Master’s – from nearby Leeds University. In 2010 he married Caroline, a local girl, at Wakefield Cathedral. Michael has always had an interest in local history but it wasn’t until he decided to pursue a career in genealogy that his passion for the long forgotten stories of the ‘Merrie City’ was really stirred. 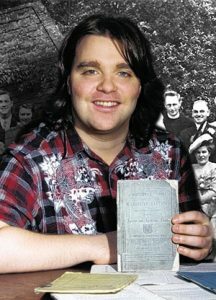 Over the last few years he has amassed a huge collection of books and pamphlets on Wakefield, some hundreds of years old. The tales told within the pages of these rare publications deserve a modern audience lest they are forgotten to history, which is why he set about writing these quirky and charming local history books. Caroline Rochford began working on her first illustrated history book in February 2012. She was inspired by the discovery of a collection of rare Victorian magazines which offered the contemporary reader an insight into the latest cutting-edge inventions of the day, from all around the world. 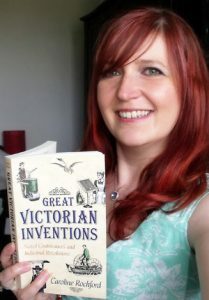 After the release of Great Victorian Inventions in 2014, her publishers, Amberley, invited Caroline to write a follow-up. After that, she was snapped up by one of the commissioning editors at Pen and Sword. Caroline’s third book is based on the amazing life story of her husband’s late grandfather. In a bid to finally escape the horrors of war, Paddy Rochford began chronicling his adventures with the British Army, however, he passed away before he could complete his memoirs. In 2010, Caroline and Michael inherited Paddy’s long forgotten papers. Inspired by the incredible tales they contained, Caroline spent the next few years researching Paddy’s career, editing his notes and piecing his remarkable story together. His book was finally released in 2016. 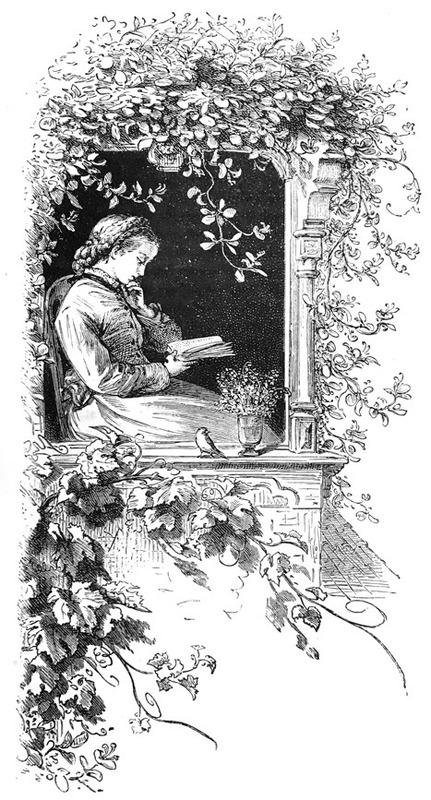 As a child, Caroline was regaled with stories of her ancestors’ many adventures on the ocean waves; and after discovering a collection of maritime poems in an antique shop, she was inspired to write her fourth book about long forgotten songs and stories of the sea. 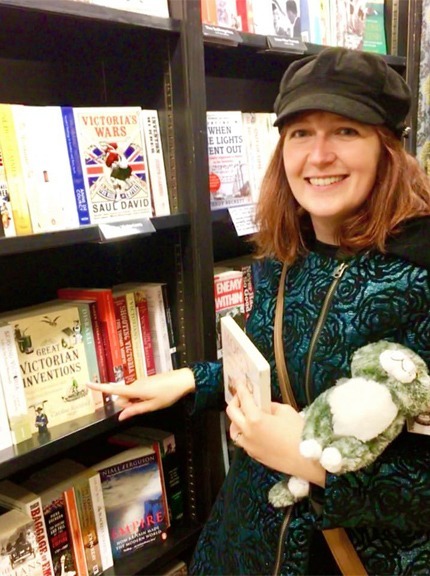 Book Reviews for Great Victorian Inventions. – The Good Book Guide, October 2014. – The Yorkshire Evening Post. – Your Family Tree Magazine, November 2014. 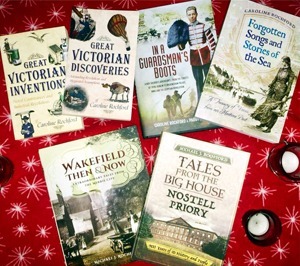 Book Reviews for Great Victorian Discoveries. – BBC History Extra Magazine. 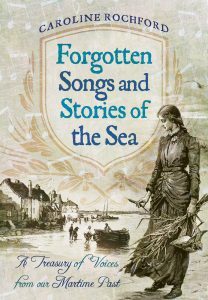 Book Reviews for Forgotten Songs and Stories of the Sea. – Sea Breezes magazine, which declared Forgotten Songs and Stories of the Sea to be their “book of the month”, March 2017, and one of their top 10 maritime books of 2017. – The International Journal of Maritime History, Vol. 29(4). – Books Monthly, January 2017. – Classic Sailor, December 2016 – January 2017. – Your Family History, January 2017.